The ABCD Diaries: OREO Churros: The Perfect Summer Treat! Just in time for summer: OREO meets Churros - The Ultimate Mashup! America's Favorite Cookie is now available as a melt-in-your-mouth chocolate churro pastry. A crispy exterior, warm soft interior and real OREO cookie pieces in every bite give OREO Churros a just-baked Oreo taste. 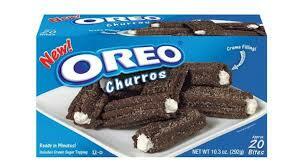 OREO Churros are available in the frozen dessert section of most grocery stores. They're perfect for any snacking occasion and are easy to prepare. They bake in just minutes. There's even a crumb sugar topping to roll them in before serving! These are super yummy! The kiddos couldn't get enough of them:) They are quick, easy and delicious. What a great treat to curb that summer sweet tooth!